Home › Triathletes Swim First › Our E-book is Available! 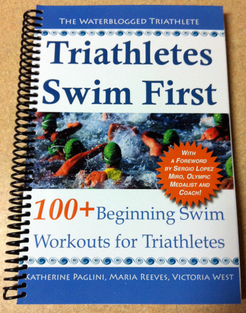 Exciting news: our e-book, “Triathletes Swim First: 100+ Beginning Swim Workouts for Triathletes” is available!!! The print version needs another 6 weeks or so, but everything has come together really well! I can’t wait to send physical copies to everyone that helped us along the way!!! It feels so good to see our book come up in search results on Amazon! Perfect for sprint and Olympic distance triathlons!Triathletes Swim First offers a fresh perspective and over 100 beginning swim workouts for triathletes who want to improve their swimming skills or supplement their existing training plan.Inside are workouts that offer everything from basic skills to introductory speedwork and pacing. A wide variety of drills will help you develop your technique. You will also find novice stroke work, challenging kick sets, specialty sets, tips, and progressions. All main sets are based on percent effort. No longer do you have to stress about intervals that are too fast or heart rates that target the wrong age demographic. With this book, you can finally leave behind workouts that are written with a “one size fits all” approach. *Plus plenty of workout tips, progressions, and focus points! Awesome, super excited for y’all!! Very exciting. Congratulations! I’ll pass this along to my tri team. Congrats!! What a wonderful accomplishment… not to mention a fabulous service for the rest of us!! Thank you so much! I’m so glad that you like what we do. I just can’t get swimming out of my system so may as well share what I know, right?